Why it really is the ‘Season to be Jolly’ - Nothing to Hide? With the holiday season looming upon us and in the midst of all this talk of credit-crunch and cutting budgets, the pressure seems to be on the digital industry right now to find answers to help assure confidence. Fortunately, Eyeblaster’s latest Analytics Bulletin seems to be helping do just that. Bringing the perspective that with the average household being a bit strapped for cash at the moment, the need to hunt for a bargain is ensuring more and more people take to the web to uncover the last minute find to be had. With a shift of emphasis from mere clicks as a way of justifying success, the report takes its perspective of this bargain hunt and helps show how online activity is a key part of a consumer’s experience in information gathering post-exposure to a marketing message, be that on or offline. What I found interesting is, when looking at the key dates in the run up to the New Year we see a couple of spikes, one around the last-posting days for sending presents as people spend huge amounts of time online, and then in the traditional last holiday week of the year – when sales are rife. Consumers are spending up to 3 minutes per page looking for information and that means from a marketers perspective, the ability for high-impact brand exposure can be 6x the traditional 30 second TV spot, and within an environment where consumers are already in a consideration-to-purchase mode. The evidence is also seen in the number of videos started, interactions and clicks rising sharply as a result of this extra time spent on page, with no extra media cost. With inquiry being a natural next step in the consumer life cycle following brand/product exposure, I personally find the move to merge display and search data into a seamless report the most exciting turning point for the online industry and convinced 2008 will go down as a key moment of maturity for digital advertising. Armed with ability to now see consumer paths-to-conversion, Eyeblaster has not been shy in releasing its first research into this area. The preliminary results have found staggeringly that up to 30% of clicks on paid searches happen as a result of being exposed to an online display advert first. When we consider no other media channel expects to measure an immediate result in situation, such as a click, but operate as a stop-and-think sign-post which pushes a consumer into a research/inquiry phase from another source, finding results for a display campaign success within search are for me the most logical and holistic way forward in campaign measurement. In a media-whipped world of doom and gloom, one thing is for sure, people are looking forward to a Happy Holiday armed with bargains they have found online. In the meantime, for the rest of us who need to instil confidence in the market-place to maintain media budgets, we have been crying out for this kind of research, and I am confident those who are mature in digital advertising will equally take such a view. 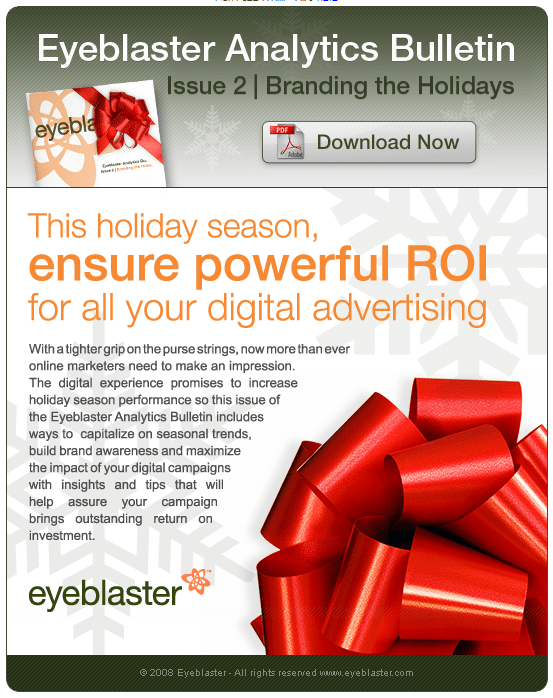 Download your copy of the Eyeblaster Analytics Bulletin: Branding the Holidays now.